This article is the fourth in a series commemorating the American Evolution – Virginia to America 1619-2019 . See article one, two, and three here. On December 4, 1619 a group of English colonists led by Captain John Woodlief dropped anchor in the James River some 30 miles above Jamestown to establish the 8,000-acre Berkeley Hundred Plantation. It’s a marvel they bypassed Jamestown. Their voyage on the 35-foot Margaret was so trying, one passenger, Ferdinando Yate, recorded every tedious weather detail during the two-and-a-half-month journey. The first part of the colonist’s bodies to hit dry land was their knees. The Berkeley Company that backed the settlement issued a sort of 10 Commandments for the colony. The first: “We ordaine that the day of our ships arrivall at the place assigned for plantacon in the land of Virginia shall be yearly and perpetually keept holy as a day of thanksgiving to Almighty God.” The first Thanksgiving feast (the Pilgrims of Massachusetts were still in England, one year and 19 days behind the Berkeley colonists) consisted mainly of oysters, ham and beer – a proper Tidewater meal, one could argue. Although anytime is a good time to visit, if you join the annual Virginia Thanksgiving Festival at Berkeley in season, be sure to raise a glass to these bold colonists and toast the spirit of America’s original Thanksgiving. 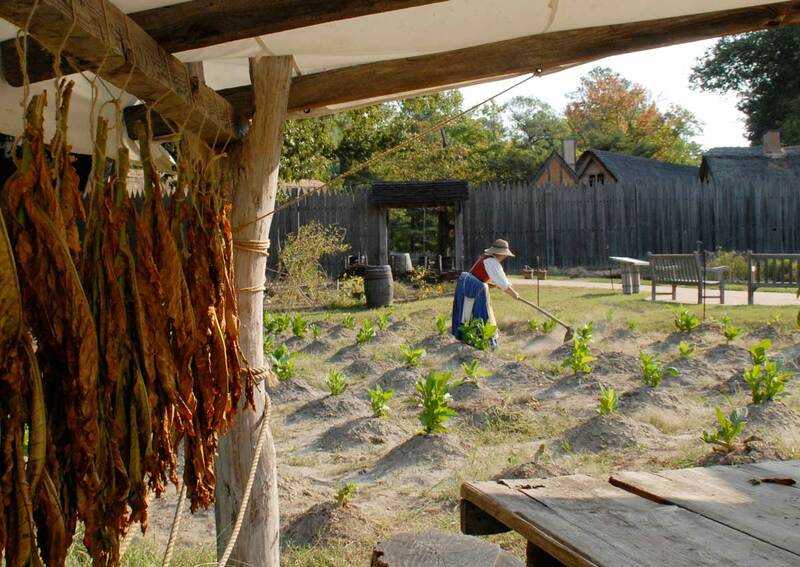 With careful planning, visitors to Jamestown Settlement can discover through the “Foods & Feasts of Colonial Virginia” how both the English settlers and Powhatan Indians gathered, prepared and stored food by the time the Berkeley settlers arrived. Already an experienced hand at colonizing Virginia by 1619, Captain Woodlief ensured the Berkeley Hundred Plantation started out well provisioned. The surviving records provide an intriguing glimpse into the diets of the early settlers – at least in the early days until they could grow and harvest their first crops. The inventory lists 8,000 biscuits, bread, 160 pounds of butter, 50 pounds of suet, oatmeal, 127 pounds of bacon, horsemeat, two lots (each equal to one thirtieth of a pound) of cheese, five ropes of onions (each rope approximately 10 pounds), pepper, salt, ginger, a barrel of vinegar (a barrel held just over 43 U.S. gallons), 11 gallons of oil, 20 bushels of wheat, 60 bushels of peas, 5 1/2 tuns of beer (a tun was equal to 260 U.S. gallons), 6 tuns of cider, 11 gallons of sack (a fortified Spanish wine related to Sherry), 15 gallons of aqua vitae (distilled spirits) and unspecified garden seeds. While Virginia menus thankfully dropped horse countless ages ago, given the plethora of craft breweries popping up across the state today, Virginians still have a penchant for dispensing good beer for themselves and visitors. By the 17th and 18th centuries a distinctive Virginia culinary tradition had developed in response to necessity and the cultural collision between Indians, enslaved Africans and English and other European colonists. Fresh game, fish, seafood and produce fattened the colonists during warm months, while cured meats and fresh wild game, oysters, herbs and roots sustained them through winter. Native produce, such as corn, beans and squash, combined with African imports, such as okra, field peas, watermelon and sugar cane, began to form the basis of Virginia foodways that not only persisted through the centuries but largely shaped the foodways of the entire American South as families – both black and white – filtered out of Virginia to settle newly opened frontiers, taking their culinary traditions with them. Now considered iconic Southern dishes, cornbread and gumbo were borrowed directly from the Indians and Africans, respectively. English settlers brought with them knowledge of curing ham, but they soon borrowed from the Indians a distinctive style that evolved into the Virginia hams that made communities like Smithfield and Surrey famous and popular spots for tourists seeking the source of these prized cured meats. How – or more specifically where – foods were cooked was a distinctively English import. Plantations, even middling ones, tended to place large kitchens in separate buildings from the main house to reduce fire hazards, unwanted heat during long summers and food smells. Whether in the detached plantation kitchens or those found within more modest houses, hearth cooking was universal. Fireplaces large enough to step into upright were equipped with numerous specialty gadgets and utensils either imported from England or made by local blacksmiths and designed for cooking on (or under) hot coals or next to open wood fires. 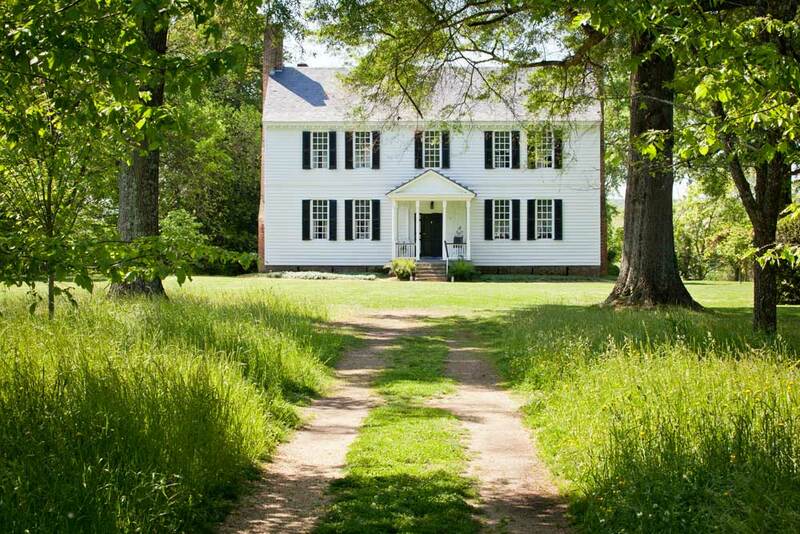 A number of Virginia’s historic plantations still boast preserved kitchens, where visitors can gain a good sense of how this vital aspect of domestic life was carried out day after day, and towns throughout the state frequently offer demonstrations and classes on this traditional cooking method. One critical point is that, almost without exception, all cooking on plantations large or small was done by African-American men and women. Virginia cooking bears the strong imprint of this rich legacy to this day. 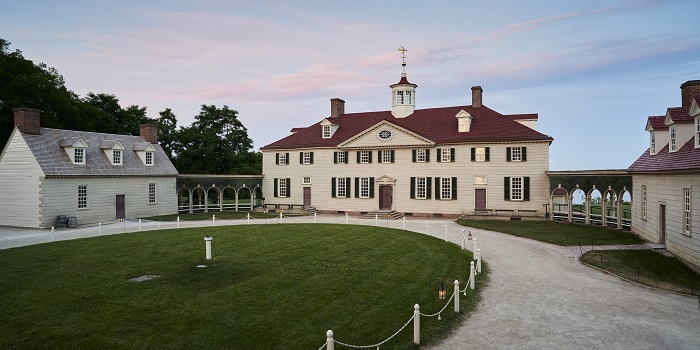 At Mount Vernon, visitors can explore the cavernous kitchen where George Washington’s famous African-American chef, Hercules, created his delicacies. Washington regarded the chef so highly he commissioned the leading portraitist of the day, Benjamin West, to paint his likeness. Hercules served the Washington family and their guests both at Mount Vernon and in Philadelphia when it served as the temporary U.S. capital. While in Philadelphia, Hercules was allowed to sale excess prepared food, earning $200 per year, the equivalent salary of a hired chef. Washington’s step-grandson, George Washington Parke Custis, described Hercules as a “celebrated artiste … as highly accomplished in the culinary art as could be found in the United States,” and he had a reputation for keeping a meticulous kitchen. Back in Mount Vernon by 1797, Hercules presented Washington with quite the birthday surprise by escaping to freedom in Philadelphia, leaving Washington’s guests, including Louis-Philippe, the future king of France, wondering where their next meal was coming from. Washington made no attempt to recover Hercules, having already stipulated to free all of his slaves upon his death. Like Washington, Thomas Jefferson oversaw the development of a young African-American chef to meet Jefferson’s exacting culinary standards at Monticello. At 19, James Hemings accompanied Jefferson to Paris when he was appointed minister to France. In Paris, Hemings trained in classical French cooking, providing him a degree of proficiency nearly unparalleled by any other American-born chef – white or black. 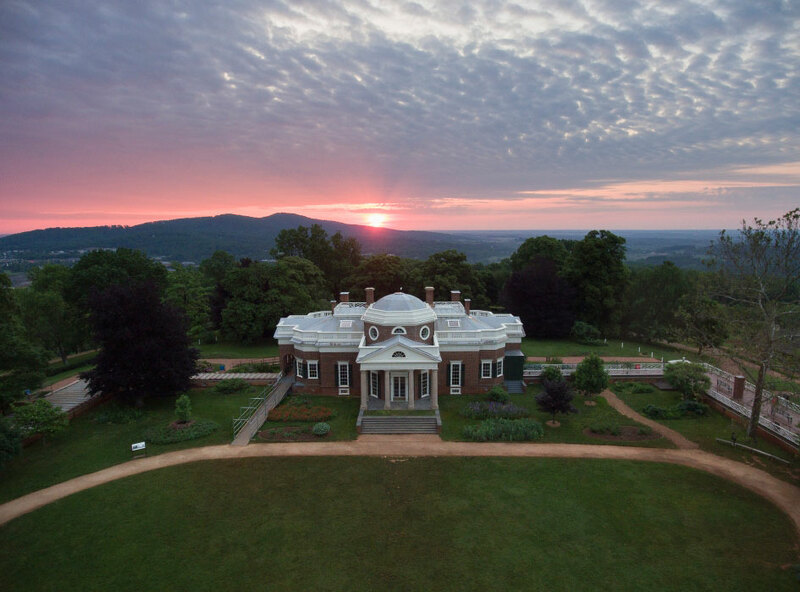 Although tempted to stay in Paris, Hemings returned to Monticello with Jefferson to train his younger brother, Peter, before Jefferson freed James in 1793. At Monticello, a tour of the kitchen, the Getting Word experience, as well as the Vegetable and Fruit Gardens provides amazing insight into the lives of James Hemings, other enslaved people who served Jefferson and the wide variety of foods they prepared and ate. Green-thumbed visitors can even purchase heirloom seed varieties favored by Hemings and Jefferson from the shop and mature plants from Monticello’s Thomas Jefferson Center for Historic Plants. Just down the hill from Monticello, stop by the 230-plus-year-old Michie Tavern and dine on traditional Virginia fare such as black-eyed peas seasoned with Virginia ham, stewed tomatoes, fried chicken, hickory pulled-pork barbecue and cornbread and buttermilk biscuits. Many such dishes have survived virtually unchanged for hundreds of years, largely thanks to the efforts of on aristocratic Virginian fallen on straightened circumstances. Mary Randolph was born in 1762 and raised at Tuckahoe Plantation (whose fine detached kitchen may also be visited) into a politically and socially powerful Virginia family. She married her close cousin, the staunch Federalist David Meade Randolph, who served in the administrations of both Washington and Adams until his cousin Thomas Jefferson displaced him for their political differences. That, added to some business reversals, prompted Mary to establish a boarding house in Richmond in 1808 to help make ends meet – an unprecedented move for a lady of her standing. Already celebrated as a hostess in a state that cherished fine hospitality, Randolph penned The Virginia Housewife in 1825, widely considered America’s first regional cookbook, which has had a lasting influence on Southern fare, having never gone out of print. In it Randolph presents the first attested recipe for macaroni and cheese, as her cousin Thomas Jefferson, with whom she grew up at Tuckahoe, brought her back macaroni molds from Europe. Randolph’s humorously describes her recipe for doughnuts as “a Yankee cake,” indicating Virginians were consciousness of a distinctive regional style even during the Federal period. After volunteering sage advice such as “A late breakfast deranges the business of the day,” Randolph offers “receipts” (as they were called then) for delicacies from England, France, Spain, the East Indies and the West Indies. Randolph parades out a staggering array of spices, including curry, allspice, cinnamon, coriander, nutmeg and turmeric, dispelling any assumption that Southern cooking was parochial. Yet the cuisine is undeniably Southern. The book bursts with recipes for okra soup, catfish soup, barbecued pork, beaten biscuits, field peas and turnip greens. Numerous recipes describe how to prepare and serve oysters in a variety of ways, including oyster ice cream, still a Virginia delicacy, indicating the state’s enduring love for the bivalves, further evidenced by the Virginia Oyster Trail and the numerous oyster festivals, tours, regions and shucking competitions. Through the centuries, the appeal and affection for these distinctly regional dishes have persisted, even as today they are being reinterpreted by contemporary chefs who are expanding the boundaries of the “food moment” John T. Edge describes in AFAR. In Northern Virginia, Tarver King at The Restaurant at Patowmack Farm forages for some of the same ingredients eaten by settlers in 1619, but subjects them to ever-evolving treatments. In the heart of Richmond’s historic district, Pasture works with only the freshest Virginia ingredients to turn out refined interpretations of classic Southern recipes such as seared fish with green gumbo, rice pie and pickled okra. The ever-changing à la carte menu at The Shack in Staunton is staunchly regional, a constant nod to hardscrabble Appalachian cooking with ingredients such as ramps, morels and fried hominy. Stove in Portsmouth, Sydney Meers’ iconoclastic approach to “Neo Southern American Cuisine, whatever,” incorporates pork belly, sweetbreads, house-made “smoochie bear” ham, and an array of locally seasonal fish, crabs, oysters and shrimp. Another impressive Virginia chef showcasing Virginia’s food heritage is Travis Milton, who is currently working on opening three restaurants in the Southwest area: Milton’s at the Western Front in Saint Paul and two restaurants at the Sessions Hotel in Bristol, Shovel & Pick and Simply Grand. His first Appalachian-centric restaurant, Milton’s at the Western Front opens in summer 2017 as a meat-and-three. Shovel & Pick and Simply Grand, opening in the one location in early 2019, represent both aspects of Milton’s background (“both sides of my brain,” as he puts it) by showcasing the rustic, soulful comfort food of his childhood on one side of the building, with a more modern take on those traditions on the other. These examples barely scratch the surface of what awaits the culinary traveler. The fact that chefs across the state continue to infuse time-honored ingredients with new vitality binds them, even mystically, to their forebears, who since 1619 have been living off of and cultivating the land and sea, and dispensing genuine Virginia hospitality. The 2019 Commemoration, AMERICAN EVOLUTIONTM, is a three-year tribute to Virginia’s history and heritage. Featuring events and activities that inspire travelers from around the country and the world to engage in the themes of democracy, diversity and opportunity. AMERICAN EVOLUTIONTM positions Virginia as a global leader in education, economic development and tourism. 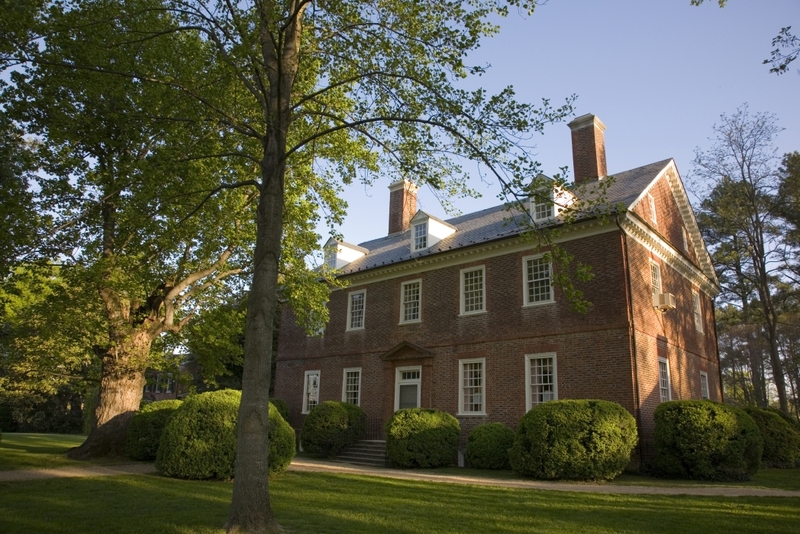 Visit www.virginia.org/history to plan your next vacation, and discover why Virginia is for History Lovers.